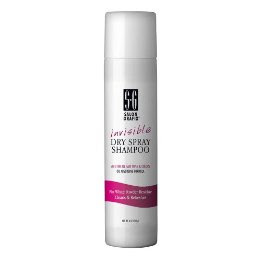 Salon Grafix's Invisible Dry Spray Shampoo goes on clear to clean and refresh your hair - with no color and no powdery residue. Just spray in and brush out. I was very intrigued by this product, but I wasn't sure what to expect. The directions were super easy. I tried it on a day when I was sick and hadn't had a chance for a shower yet. My hair was greasy and dirty. After spraying on the shampoo and brushing it, I felt my hair. It felt a lot cleaner! It wasn't as good as a regular wash, but it was close. I was pleasantly surprised. The shampoo is not at all powdery or messy. It also has a nice light scent. The only thing that I wish was different was that it didn't have an aerosol container. Although with spray on shampoo it may be necessary to get the best coverage. Overall, I think this is a great alternative to shampooing if you are not able to. This would be really great for camping, if you loose your power, when you are sick, or even if you are just too lazy. disclaimer: I was provided a free sample of this product in exchange for this review. I was compensated in no other way and the opinions stated here are my own honest thoughts. I love this product! It's so great for me, because it is so hot in the summer and by the end of the day my hair starts to look oily. Just a quick touch up with this, and I'm good until shower time!